Utilising Sienna X great products which add anti aging properties of 10 to their spray tan ranges from a light shade giving you that glow to a full on dark tan all personalised to suit your skin. Offering a mobile service in your own home I bring along my Sienna X tanning Tent and Spray gun to bring out that glow without the sun. You will need to exfoliate and do any hair removal no less than 24 hours before your appointment. A patch text will also be required to be done (this is renewed every 6 months) a week to 48 hours minimum before your appointment. You will need to wear dark clothing while the tan develops which is from 2 to 8 hours depending on tan used – most people have it done last thing at night and sleep in black in a old sheet and shower off in the morning to reveal your wonderful tan. Ideal on their own for a treat or added to another treatment. Ideal with a massage for a pamper or relax in your wrap while having a wonderful thai foot massage or rejuvanating japanese facial massage or a liz earl facial. I offer a range of body wraps which include a body brush to enhance the products absorbtion and exfoliate the skin so you are treating new skin cells with these wonderful products. I can offer this treatment mobile if you would like a pamper session in your own home. Body brushing using naturall bristles is important to not only exfolite the skin and remove the dead skin cells, but improving lymph drainage and circulation. This is performed on dry skin invigorating the skins surface, after working each area from legs, arms and back a oil or lotion is applied to leave you skin smooth and refreashed. 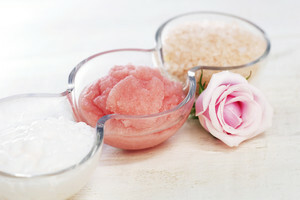 Treatment involving dry massage techniques, body brushing, salt scrubbing and oil massage all to assist with cellulite which is a malfunction of the skin.